Dimensions 0.75 by 6 by 9.25 in. Amazon.com description: Product Description: The fourth edition of Symbols, Selves, and Social Reality provides students with a succinct, engaging, and affordable introduction to symbolic interactionism--the perspective that social reality is created, negotiated, and changed through the process of social interaction. Focusing on how elements of race and gender affect identity, the authors use real-world examples to discuss the personal significance of symbolic interactionism, its expanding theoretical scope, and its relationship to other prominent perspectives in sociology and social psychology. They skillfully cover empirical research topics that are inherently interesting to students, such as the dynamics of self-development, impression management, identity transformation, gender play, rumor transmission, and collective action. 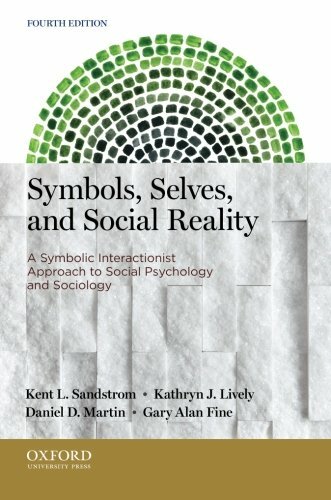 About: The fourth edition of Symbols, Selves, and Social Reality provides students with a succinct, engaging, and affordable introduction to symbolic interactionism--the perspective that social reality is created, negotiated, and changed through the process of social interaction. 3 edition from Oxford Univ Pr (March 25, 2009); titled "Symbols, Selves and Social Reality: A Symbolic Interactionist Approach to Social Psychology and Sociology"
About: The Second Edition of Symbols, Selves, and Social Reality introduces students to the symbolic interactionist perspective in sociology.